What Liquid Makes a Plant Grow Faster? Two forms of fertilizers exist on the market today: solid and liquid. There is such a thing as applying too much fertilizer, as over-fertilizing can burn and kill plants. Solid fertilizers come in a more concentrated form and are less likely to be washed away by frequent rainfall, but it is easier to burn plants with them. Liquid fertilizer affects plants quickly and is easy to apply evenly, thus reducing the chance of burning plants. Unlike solid fertilizers, liquid fertilizers are in a concentrated form and are meant to be diluted with water before use. This can be beneficial if shipping is an issue. If your liquid fertilizer does not include a sprayer, pour the liquid fertilizer into a liquid fertilizer hose sprayer and close tightly. Insert your hose into either the sprayer that is attached to the liquid fertilizer bottle, if there is one, or the separate liquid fertilizer hose sprayer. Turn on the hose's water. 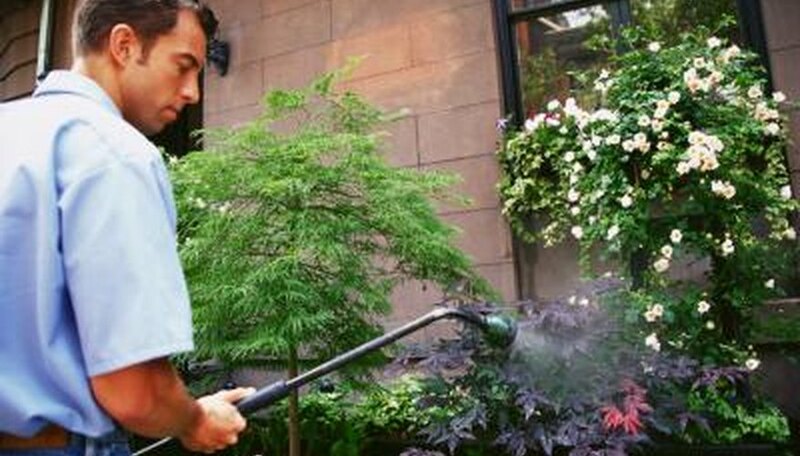 Spray an even coat of liquid fertilizer on the plants that you wish to fertilize. The best pet-friendly weed control involves no herbicides at all. According to home improvement specialists "The Handyguys" in a 2010 article written for Home Ec 101's website, over-seeding your lawn creates a thick lush carpet of grass that inhibits weed growth. Weeds can't invade the lawn simply because there isn't enough room to establish a root structure with all that green grass in the way. Corn gluten pellets spread over the lawn will inhibit growth of weeds and crab grass and won't harm your pets if they happen to eat some. The pellets are composed from the residue of starch production from corn or wheat and are often mixed with molasses, fat or colloidal clay to bind them. These pellets are used primarily as a cattle feed and may be purchased anywhere bagged feed for livestock is sold. Yes, the name is a little intimidating, but that shouldn't put you off this pet-friendly fertilizer. Blood meal is literally dried, powdered blood, which is often mixed with animal bone meal. The result is a fertilizer high in nitrogen, a mineral crucial to plant development. The compound is water-soluble, which means it can easily be mixed as a liquid fertilizer to deliver nutrients quickly. Precise measurements are important when using any liquid fertilizer, as too much of the compound could burn your lawn. Potash is a potassium containing salt which occurs naturally in the earth's crust. The copper-colored mineral is water-soluble and often included in liquid fertilizers because of its potassium content. Combining this mineral with blood or bone meal provides a balanced, pet-friendly fertilizer for your lawn. Mix 16 tbsp. Epsom salt and 8 oz. ammonia in a jar until the salt dissolves. Pour 2 gallons of water into a garden sprayer and add 2 tbsp. of your liquid lawn fertilizer concentrate. Mix them together. Spray the mixture across your lawn. This will cover a space of 200 square feet. To cover 400 square feet of space, use 4 tbsp. of concentrate with 4 gallons of water, and so on. Pour one can of any kind of beer and one can of carbonated soda in a bucket. Beer and soda can provide grass a great source of the carbohydrates needed for growth. Add one cup of ammonia to the mixture. Ammonia provides nitrogen to the soil, which essential for plant growth. Be sure you wear gloves and mask when handling ammonia; its fumes can be toxic. Combine the mixture with one cup of corn syrup or molasses. The corn syrup or molasses contribute carbohydrates and sugars that can be used by grass. Molasses also contains iron for aiding the greening process. Stir in one cup of dish soap and half a cup of mouthwash. The dish soap will help the fertilizer stick to the grass for absorption and the mouthwash can kill off insects. Make sure you do not use anti-bacterial soap, because it can kill healthy microbes. Pour all ingredients in a 10-gallon hose sprayer and attach to your garden hose. Walk back in forth in a line across your lawn. Apply an even application by spraying from side to side. Water your yard thoroughly after application. 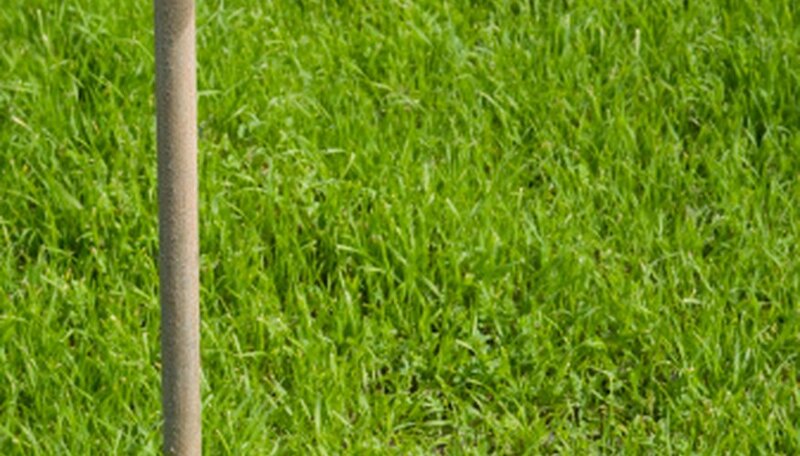 The best liquid lawn fertilizer to use for an overall healthy lawn is a "weed and feed" fertilizer. This type of liquid fertilizer contains a herbicide, which feeds the healthy lawn while destroying the weeds that are in the same area. Attach a hose and nozzle to the liquid fertilizer spray bottle for fertilizing large areas. Many liquid fertilizers come in an easy-to-use spray bottle. Turn on your hose to a medium flow. Spray your garden or lawn area with the nozzle. The water automatically dilutes the fertilizer to the proper amount for you. Mix liquid fertilizer with water in an old pitcher or watering can according to package directions. Apply the fertilizer to your houseplants or potted plants at the rate recommended on the package. Rinse your container with water before storing. Liquid fertilizers such as Miracle-Gro or organic, nitrogen-rich liquids like fish emulsion and seaweed kelp all represent good choices for feeding tomatoes at planting time. Take care, however, to limit nitrogen fertilizer, in liquid or solid forms, during most of the growing season. Otherwise, the tomato plant could become all vine and no fruit. Put the beer, cola, mouthwash, ammonia and soap in a small bucket. It doesn't matter what order you add the ingredients. Mix the ingredients together with a wooden spoon to form the liquid fertilizer. Transfer the liquid fertilizer to a watering can. Pour the liquid fertilizer into flower pots or throughout the garden. This recipe will cover an area of 400 square feet. Repeat once per month during the spring and summer months. Liquid fertilizers, such as diluted fish emulsion and soluble plant food, are two liquids that make plants grow faster if used properly according to package directions. Pour 2 cups of tap water into a large pitcher and let it sit overnight to dissipate chlorine that may be in the water. Add 1 cup of beer to the water to increase the microbial action in the soil. Pour 1 cup of Epsom salt in the pitcher and mix it until the salts dissolve. Finish off the homemade liquid fertilizer with 1 cup of ammonia to increase level of nitrogen, which is something that all plants need to grow. Pour the homemade liquid fertilizer into the plant's soil or over patches of grass. Apply 4 tbsp. for large potted plants, 3 tbsp. for medium-size plants and 2 tbsp. for smaller plants. This amount of mixture should cover more than 400 sq. ft. of area at the prescribed application rates.